This is a 1 minute, 25 second improvement over the Pokemon TCG TAS from 2010 by p4wn3r & FractalFusion. Read the previous TAS's notes if you want to know more about the game. The basic gist is, every duel is won in as few turns as possible. You do this by finding a duel where the opponent has the right shuffle for the job and you win the coin flip (RNG advances every frame on the overworld), and then manipulating your deck's contents to get anything you need in your starting hand to take them out. RNG doesn't advance during deck editing, so you can go back and expand deck edits to do more. TAStudio helped immensely with doing all this; I don't think it'd have been possible to edit the input like I had to do here back in 2010. Mysterious Fossil is a Trainer card that acts as a Basic Pokemon, has 10 HP, and isn't worth a prize. There are two duels you want to lose as fast as possible, and Fossil is a better option than using a Pokemon. Using Fossil saves an entire turn over the old TAS's Ronald 1, and in both cases, it saves the animation of Ronald taking a prize. This is a completely undocumented feature, but you can scroll an entire page at once in the deck edit screen with the Select button and up/down, which is much faster than moving one at a time. The old TAS does not use this at all. This is an improvement that was listed in the notes of the old TAS. Basically, you want to minimize how many frames it takes to get to the cards you want to add/remove, mostly by minimizing new cards you get in boosters. What matters most is Trainer cards that come before PlusPower in the menu, as PlusPower is by far the non-Energy card most tweaked in deck edits. For the most part I didn't bother with avoiding any Pokemon cards. The booster pack manipulation I do in this run does not actually lose any time at all, thanks to having to wait before starting duels for good RNG anyway. Like, if you found a good duel that you have to wait 10 frames for, you can wait some of those 10 frames to manipulate the last duel's boosters! 4. Naming the player "I"
For most of the game text is 'instant', but having a one-letter name saves time during the tutorial, and who wants that to be any longer than it needs to be? It's a bit funnier than "MARK" too! It might save some lag frames as well when displaying text during the rest of the game. I think this route went very well, although my PlusPower count was very bad at the start, partially because I had to get a Defender before Isaac. I was curious about Bulbasaur+Lightning first and tried it out, but since I had to edit in a Hitmonchan + Fighting Energy to take out Jennifer, I was already over 2 seconds behind the Charmander route. Charmander & Friends also saves deck edits by having valuable cards like Ponyta and Rattata deep in the deck from the start, which definitely made me confident about my decision. If you watch the old TAS, it looks incredibly fast... besides the tutorial of course! But, on a frame level, there are actually a TON of improvements to be made to the old input. 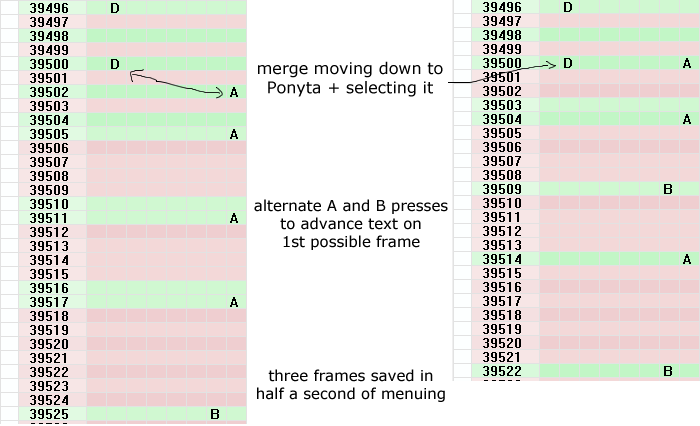 This image shows an example of the menu improvement possible, taken from placing a basic Pokemon in Ronald 1. All of p4wn3r's input has time saves like this. There's other little things like choosing the prize which results in the least lag frames; it takes longer to display a card with a ton of text (PlusPower, Double Colorless Energy) than a Basic Energy. This wasn't relevant in VBA, which had far less lag frames on displaying text. The biggest time save is probably deck edits; the old TAS did 17 deck edits, while this TAS does 6. My edits are quicker for the most part as well. These notes were more for my own reference than anything, but they might help if you want to actually understand what goes on. Detailing the cards I put in helped a lot for returning to this TAS after taking breaks from it, and it doesn't hurt to put it in the info here. No edit needed. I managed to find a frame for both of them where I had my 1 Machop, and a Fighting Energy, and they had just one 40 HP basic, and I went first. Wasn't expecting it. Only Charmander and Friends can win a duel without edits, as the other decks have no high-damage cards in them by default. Both battles have Slot 40 in the opening hand, and Machop is only 5 away, so that's perfect. Brandon's got an Eevee out so I needed the PlusPower to knock that out. The Bill gets me Slot 60 from the top of my deck, which was the fastest way to get a Defender in my hand. Sara has a Goldeen, so the best way to take it out is 20 + 2 PlusPowers. My starting hand against Amanda, who has a Poliwag out, has cards 56 and 57, and it's pretty quick to add a Paras while I'm already removing/readding all that energy to shift my Machop/PlusPower down together. Farfetch'd isn't the fastest way to kill Joshua; coin flip attacks are to be avoided; but my options are limited because Amy is very very tough to beat, and you can't do an edit right before her. I also need 4 PlusPowers to beat her without any coin flips, and only have 3 (bad Colosseum pack luck), but I have an Item Finder I use on turn 2 to get one of turn 1's PlusPowers back. I end up using EVERY single card I get in the Amy fight, all but two of which (Item Finder discards) had to be manipulated. This fight could definitely have been faster (her Energy Removal didn't help), but the no-edit Grass Club I got after makes up for it. Ideally you'd want to go second against Ronald instead of first, but the battle I found here had the Fossil in a position that minimized deck edit time. I tried some other seeds, but I kept going first in them too, or Ronald would have extra actions on his turn, like placing more basics on the bench (and just one action like that takes longer than me going first and passing control). From there, I manage to do the entire Grass Club without editing. Brittany had a seed where she just has Fat Pikachu out, and I have my Machop and Fighting Energy. Michael has just a Mankey out, which I Rattata PlusPower Bite, the PlusPower gotten off the top with a Bill. I had to wait about a second for that Michael fight, but the next fight I didn't wait at all for, so it all balances out. Heather has just a Venonat, and I've got Ponyta + DCE. Same goes for Kristin. Ideally, Rick would have 2 Porygons, which you could easily take out with Machop. But I wasn't able to find that, so instead I need to use 3 PlusPowers against his Koffing lead. This deck edit ended up being very quick though, so I'm happy with it. It all shifted into place very nicely. The Jessica fight also uses the PlusPower in slot 56, as well as a different Rattata that's been deep in the deck from the start of the game. This part went through a lot of changes and redos, and a 1+ year break. I originally went Ken, then Murray, but the Murray frame I found was abysmal (Energy Removal + Psyshock succeeds). Switching Gene and Murray, my luck was MUCH better for both of them. I couldn't find a good Chris frame after Gene, so I go back to the Rock Club a second time; it does lose about 2 or 3 seconds of overworld movement, but I believe I more than saved that with my duel luck and being able to beat these 5 duels (including 4 club leaders) with one edit. This edit only removes/adds 4 cards, yet sets up 12+ cards in positions I need. I could not be happier with that. Unfortunately, I couldn't find a fantastic Mitch frame (two Mankeys only is ideal). And I was all out of route changes, since he was the last guy! So, I needed all 4 PlusPowers to beat his Machop+Mankey. But I managed to do the entire Pokemon Dome with no edits afterwards, which is great! The old TAS did 5 edits in the Dome, one for each trainer. I got lucky, and used a Computer Search and Item Finder to help out with getting PlusPowers in a couple duels. Every Dome fight except Rod can be beaten on turn 1 even though they have 2 Basics, because their AI doesn't play their Legendary card during setup. They save it so they can use its Pokemon Power on their turn. Too bad they don't get a turn! However, an extra deck edit would lose you a lot more time than any individual improvement would save. Water Club second and the two Rock Club trips are not things I'd do again if starting over, but as it is, the luck worked out to do only 6 deck edits, and changing the order might ruin that. A deck edit is around 5 seconds; each of these is 1 or 2 or 3 seconds lost. Accepting as an improvement to the previous publication.